I didn’t grow up eating pumpkin or desserts for that matter. My mother was strict with our sweets intake. It wasn’t until I met Chris that I started having more pumpkin desserts. I find most of the people are either a pumpkin lover or hater. Not many in between. It’s the same with carrot cake. I think it’s the spice. Either you love or hate it. Chris loves pumpkin anything so I’m trying to incorporate pumpkin in as many recipes as I can. He approves this one. Have a great rest of the week! In a medium bowl combine graham cracker crumbs, butter, sugar and pumpkin pie spice. Use a fork to mix everything together and then pour the mixture into the baking pan. Press the mixture into the bottom of the prepared pan and bake for 8-10 minutes or until crust is lightly brown. Remove from the oven to a cooling rack and allow it to cool while you prepare the filling. Do not turn off the oven. Meanwhile, using a stand or electric mixer, beat cream cheese, sour cream and sugar until smooth. Add egg, vanilla bean paste, pumpkin pie spice and salt. Continue to beat until combined. Pour filling over the crust and spread evenly with a spatula. Gently place chocolate chips on top. Return pan to the oven; bake for 25-30 minutes or until edges are lightly brown and the filling is set. Allow the cheesecake to cool completely then transfer it to the refrigerator to chill for a few hours before serving. 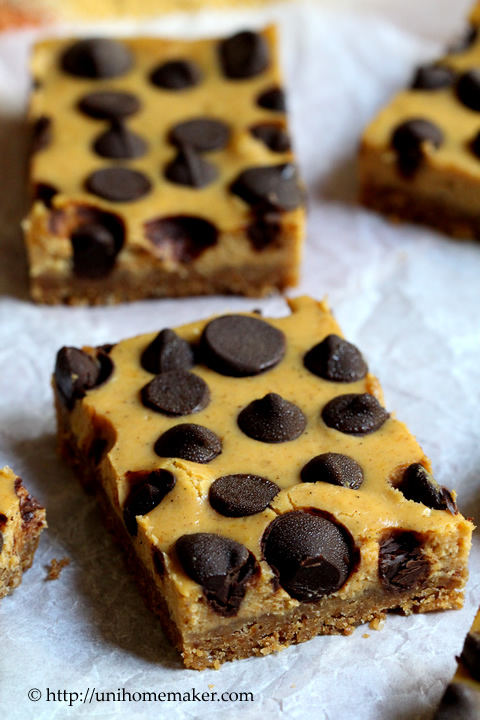 Your Dark Chocolate Chip Pumpkin Cheesecake Bars have all the makings of delicious goodness, Anne. Seriously, what’s not to love! We still have lots of pumpkins around our area and it just so happens that I’m off to Trader Joe’s today. I didn’t even know they had sold pumpkin cream cheese. You KNOW I’ll be looking for it! Thank you so much for sharing, Anne. These just may be on my Thanksgiving table! I just happened upon this recipe from Inger for Spiced Pumpkin Cream Cheese Dip. If Trader Joe’s doesn’t have Pumpkin Spice Cream Cheese, do you think I could try using Inger’s recipe? Here’s the link. Hi Louise, I would go with the regular cream cheese instead of the whipped one. And as long as the end result of this pumpkin cream cheese recipe is still a consistency of cream cheese and not too loose or watery, it’ll be fine. We discovered the miracle of pumpkin cream cheese, this fall. I love what you have done with these bars, and I needed to see something like this, this morning!! Thank you for sharing your great post!! i love your idea, cake as snack bar. I’ve never seen pumpkin cream cheese…. I’m going to have to watch for it next year! Love the idea of the dark chocolate and pumpkin !! I never turn down anything cheesecake! Yum! These stopped me in my tracks, Anne! I love pumpkin and chocolate, ad I’m with you — I prefer cheesecake in bar or mini form. It’s much too heavy most of the time. These are perfect! I love pumpkin desserts & this is no exception! They look tasty. wow i love your creatity Chef Anne! Oh my goodness Anne, these bars look are so mesmerizing! I love cheesecake in bar form too and I would gladly polish off these wonderful pumpkin chocolate ones in no time 🙂 Ooh and I need to find that pumpkin cream cheese next time we stop by a TJ’s, it sounds delicious! Pinning, I can’t stop staring at those chocolate chips, they look so enticing and magical! I didn’t even know about pumpkin sweets before I moved to London a few years ago! Glad I’ve discovered them 🙂 love your bars, simply beautiful! I love the sound of these bars! I don’t eat cheesecake too often because I find it a lot of the time too heavy …. but these I can definitely get behind! Especially with the pumpkin / chocolate combo! Happy Wednesday Anne! I could definitely live without pumpkin but I can’t pass up a dessert that looks like this!! Your pumpkin bars look terrific, Anne! I love these small serving size cheesecakes and bars are always special yet casual at the same time, which I love. I can’t say I’m a big fan of pumpkin baked goods but I think I’m coming round to all sorts of things as I get exposed to good recipes. I find myself liking cinnamon more and more, for example. : ) Anyway, I know where to go to if I need a great bar dessert recipe. And those chocolate chips on top are perfect! I loveeeeeeee pumpkin too! I’m highly susceptible to turning orange-yellow (sigh) from too much pumpkin and carrots but these look so delicious! Oh my goodness…these look and sound so good. Dark chocolate and pumpkin and cheesecake? I’m in love! I didn’t grow up eating much dessert but I know even my health-conscious dad would have loved these! 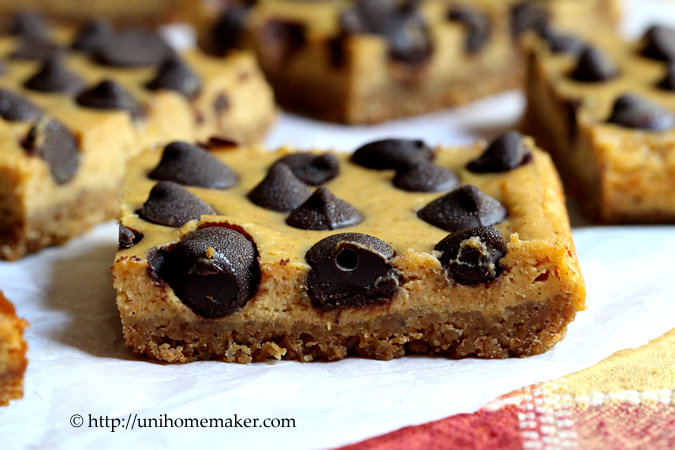 I tried choco chip pumpkin bars last year and found it so addictive. Never tried them with cheesecake. These sound amazing and I can imagine how delicious this must be! I hate cheesecake slices that are so big you can’t even take one bite without feeling nauseous from the decadence! These bars look like they are perfectly sized and perfectly flavored! I agree about the spice making pumpkin a love/hate thing. I do love it, and find that chocolate goes especially well with it. Though I find most ingredients go well with chocolate…lol! These look gorgeous! I am loving the chocolate/pumpkin combination right now. Actually my last two posts involve both of those ingredients! Love that you combined them with cheesecake- yum! 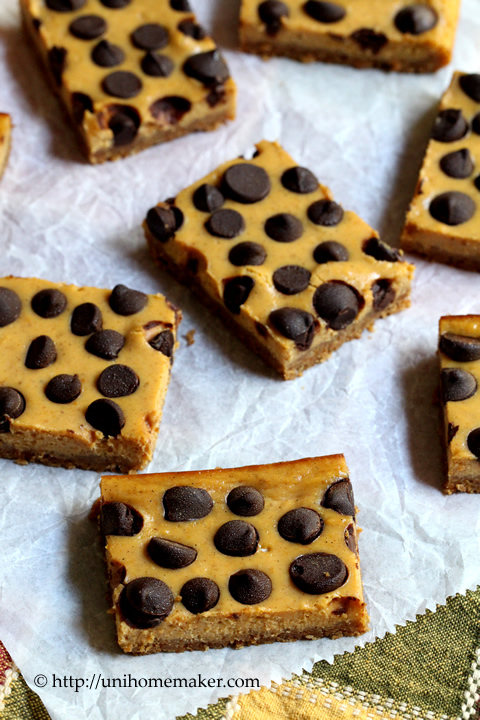 These would be extremely dangerous near me, a pumpkin cheesecake bar – perfection! These look so good – you’re going to have to stop posting such great photos of the food you make, I’m putting on weight just looking at them! I can never say no to pumpkin and/or cheesecake. Put together, definitely no! This is too good! Fabulous seasonal treats! I’m torn between wanting to make them as gifts or just hording a huge box for myself. YUMMY! We are approaching a long weekend and this would be the perfect treat to enjoy with the boys! I was curious what brand of dark chocolate chips do you generally use? I plan to swing by Trader Joes to see if I can find the pumpkin cream cheese (hoping mine still has it). Thanks for the sharing, Anne! Pumpkin+cheesecake+choc chip ?!? All in one?!? Oh my gosh, I neeeeeed!!! Feel free to squeeze in as many pumpkin recipes as you can. I don’t think you can ever have enough pumpkin, especially when it involves cheesecake and chocolate! I’m with you and trying to squeeze in those pumpkin recipes…. great looking bars – just need a glass of milk! This looks so good! I love pumpkin and dark chocolate together. 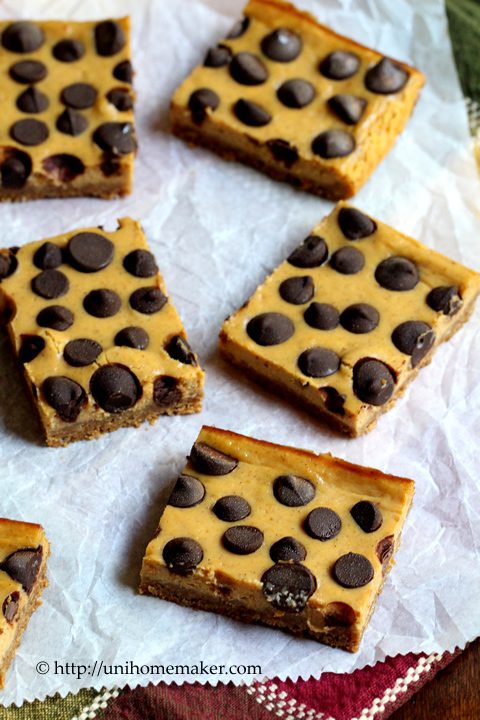 These look delectable with all those chocolate chips perched on top! I love the combo! I don’t use pumpkin with chocolate enough. Hope you’re having a great weekend! These would be so perfect for Thanksgiving dessert, especially for someone like me who could definitely skip the pumpkin pie. I’d much rather have one of these! Pumpkin cream cheese!!!??? Never heard of it but sounds oh so yummy! You have got way more food choices over in the USA. Being Italian, I did not grow up with pumpkin anything, but I do so love it. And you’re right about either loving or hating it. 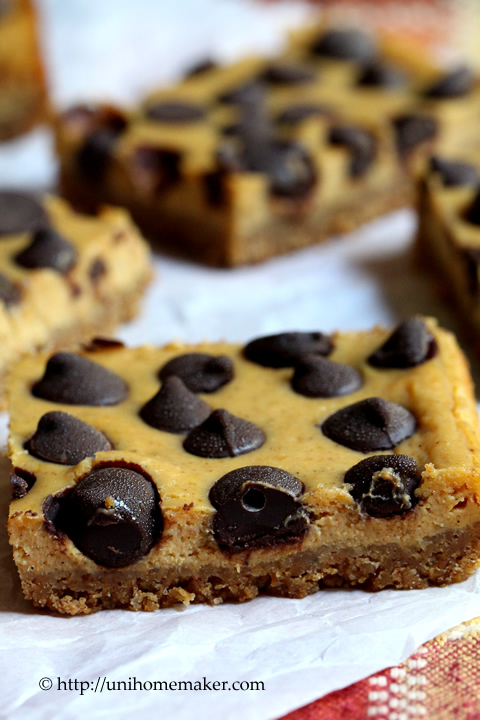 And I know I would LOVE your dark chocolate chip pumpkin cheesecake bars! Pinned! Oh these look delicious. I just love pumpkin + chocolate together! I Love the way these look Anne! The chocolate chips look like polka dots and polka dots are my favorite thing! Anne, these look scrumptious! I love every single component of the cheesecake bars. Pinning right now. Mmm. I almost want to lick my screen. These are too beautiful!! I want one right now. I totally agree. Most people either love pumpkin or hate it. I LOVE it and really want to try this recipe ASAP! Thanks for sharing at Saturday Night Fever!